Most anglers are pretty open-minded when it comes to fishing. Some have their favorite species of fish and they concentrate on that specie. Other anglers, in fact most anglers, just want to have something pulling back on the end of their line. They would rather catch a bunch of bass than not catch any walleyes. The autumn months are a great time to take advantage of several species of fish that are willing autumn biters. Panfish, in many bodies of water, can be very easy to catch in the fall. However, to really get in on the panfish action, you’ll need to alter your presentation a little bit. Here are some of those alterations. Much of the time we think of bluegills and crappies as being a fish you would chase in shallow water. While that is true in the spring, in the fall you can do very well in deeper water, say fifteen to twenty five feet depending on the lake. To find these deepwater panfish, some sonar work is necessary. At times they will be holding near a weedline or some form of structure, other times they will be near baitfish away from any structure. Turn the sensitivity up on the sonar and cruise around areas that you suspect could hold fish. Raymarine sonar units have a color display that does an outstanding job of showing the fish. Set the unit so the bottom of the lake is close to the bottom of the screen. That will provide the best picture of what’s below the boat. Once a school of fish is found, you’ll want to stay right on top of it. If there’s some wind, move a little upwind, drop an anchor, and drift back right over the fish. Now you can drop your bait right down to them. If bluegills or yellow bass are the primary quarry, go with a one/thirty-second ounce jig, or maybe even a 1/64th if they are reluctant to bite. Usually the larger jig will work fine. Crimp a splitshot onto the line a foot or so above the jig so it gets into the fish–zone faster. If crappies are what you want to catch, go with a sixteenth ounce jig. For either crappies or bluegills, Gypsi Jigs are a great choice. These jigs need to be tipped. You can use live minnows or pieces of a crawler, but Impulse Mini Smelt work just as well, and you’ll catch more fish per bait. Instead of re-baiting after every fish, you can catch several fish per bait with the Impulse. These small jigs will perform best on four pound test P-Line CX Premium line. Team this with a light action rod and you’ve got an outfit that will put lots of panfish in the boat. Panfish are great in a frying pan: Keep a few for supper and let the rest go. That way they’ll be there when you return, and return is something you’ll want to do after experiencing the fun fishing that panfish can provide in the coming weeks. 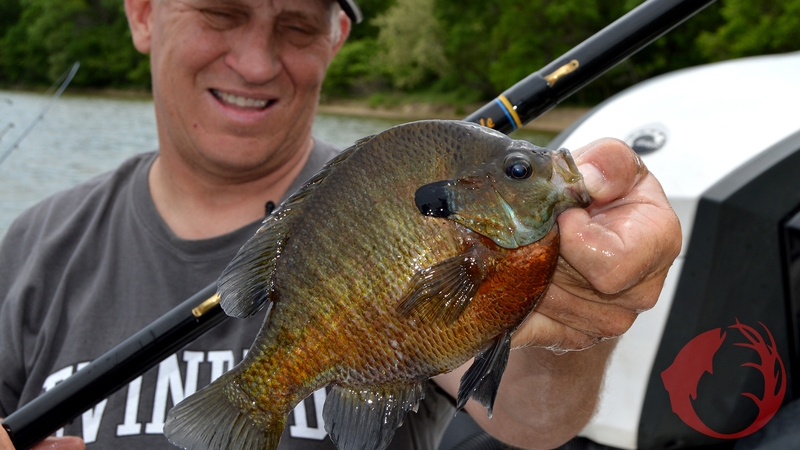 Photo: Jumbo bluegills like this one will be ready to bite in the upcoming weeks.